Halloween for the Christian Family? Is Halloween evil? This morning, I've been reading some great articles on the origins of Halloween. Halloween (and it's predecessors) has long been thought of as a day when the dead can return to the earth, and ancient Celts would light bonfires and wear costumes to ward off these roaming ghosts. When Christians began to influence the Celtic lands, Pope Boniface IV established All Saint's Day and All-hallows Eve as ways of redeeming the Celtic festival and celebrating church martyrs who were a testimony to the victory won in Christ. Christians dressed up their children as devils with red suits, horns, and a forked tail as way to mock him. No one thinks that the devil actually looks like this, but the idea is to taunt Satan, because he has lost the battle with Jesus and no longer has any power over us. In our day, Halloween is big business. Some estimate that it is America's biggest party night. As a cultural celebration (mostly unrelated to its pagan roots), we cannot ignore it. Perhaps the best way to engage our neighbors and redeem the season is to participate in neighborhood parties and community events. There’s no gospel regulation that says, “Don’t dress up! Don’t give or receive candy!” In fact, Halloween is a great opportunity to acknowledge the demonic world and celebrate Jesus' victory over it with our un-churched friends. Can my kids handle it? While it may not be wise to engage in some Halloween activities, God has given us a mind and a community of believers to process decisions and activities with wisdom. Gospel freedom doesn’t forget gospel discernment. If my 4-year-old struggles with nightmares, because he saw a scene in a movie with zombies, then it is unwise to take him to a Haunted House where I know that a dead person will pop out of a grave at him. The average mom practices this kind of discernment every day. On the other hand, a child's fears give us a great opportunity to talk with them about the gospel. 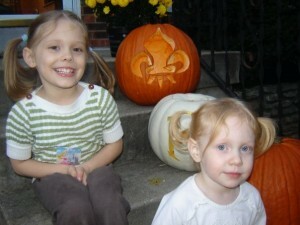 On Halloween, the most innocent activity may be met with something fearful for a child. Take this opportunity to talk about the reality of evil, Satan, sin, and death with your child, and how Christ has "defeated all of the monsters forever." Got any good ideas? Here are a couple of quick ideas as to how Halloween can be an opportunity to open your homes and lives to those around you. 1. Carve pumpkins. This has become a bit of a family tradition for us, and, though (I must confess) it hasn't been the best thing for meeting neighbors, it definitely gets us into the festivity of the neighborhood. 2. Go “Trick or Treat-ing" in your neighborhood and invite people over for coffee or cider afterward. This is a huge opportunity for interacting with people that you might otherwise rarely see or engage. We've met neighbors that we’d never even seen before! 3. Have a “Movie Night.” Gather your Community Group and friends, and show fun, family-friendly Halloween movies in your home--or even better--on a giant screen on the side of your house. Gather your neighbors to help you set up andserve popcorn / drinks. There is no better way to make friends than by throwing a party together. Introducing the new PROOF Pirates! I learned about God’s grace while sitting with my dad in his Dodge pick-up truck after school. I was in ninth grade, and I overwhelmed with things that seem silly now—schoolwork, acne, girls, and my scrawny physique. That day, my dad taught me a lesson that I pray I’ll never forget: “What God says about you is more important than what others say.” In other conversations after that, I learned about what has been called the doctrines of grace—the simple message that who we are as Christians is not determined by what we do or what we look like, but by what God has done for us. These doctrines changed my life. By God’s grace, I’ve learned to believe God’s promises for me are true. What God has determined for me through the work of His Son Jesus makes me who I am. I am loved even when my performance doesn’t stack up. After all, Jesus came to save sinners, not those who get everything right. This Fall, the SojournKids creative team is releasing a new PROOF Pirates family devotional, music CD, and VBS curriculum. Maybe you've sailed through waters of God's grace with us before. Maybe this is your first opportunity. We put together that unit of study as a way of reclaiming the doctrines of grace for the next generation. Pick up one of the new resources below and sail with us on an adventure of grace. 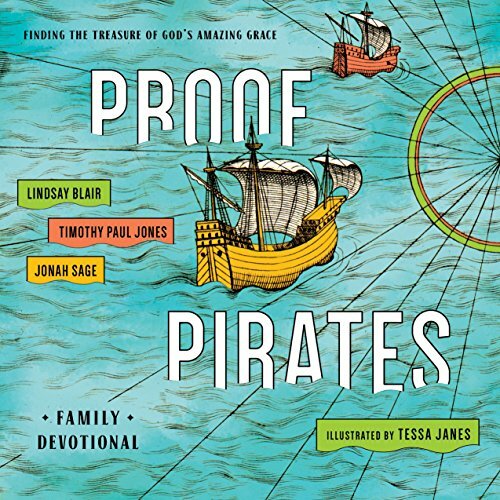 PROOF Pirates by Lindsey Blair, Timothy Paul Jones, and Jonah Sage introduces kids to God's amazing grace through a fun-to-read pirate story about a boy named Jesse whose parents send him on a scavenger hunt. Along the way, children will learn with Jesse key truths about God's grace. PROOF Pirates VBS and Bible Club Curriculum by Jared Kennedy, Fletcher Lang, Lindsey Blair, Mandy Groce, and Tessa Janes introduces kids to God’s amazing grace through a five-day, pirate-themed curriculum for use in Bible clubs and Vacation Bible School. Whether using a treasure map to teach about God’s sovereign plan or a skeleton to explain how God makes dead people walk, PROOF Pirates helps kids remember the one message we never want them to forget. This week’s SojournKids Bible lesson was “God Provides for the Israelites in Famine” (Genesis 42). Use the questions below to review it with your kids. You can also review the weekly North Star Catechism (below) and monthly SWORD Bible Memory (back). ASK: How did God warn Egypt of the coming famine?God gave Pharaoh a dream to tell him there would be seven years of plenty followed by seven years of famine. ASK: What did the king do when he discovered what his dreams meant?The king appointed Joseph to collect grain during the years of plenty to provide for the people during the lean years. 36. What is turning from sin called? To repent means to turn away from sin and turn to Jesus. Leader 1: This month we have learned about Joseph and Daniel. Both of these men from history were men who experienced really difficult times in their lives (Can you remember some of those times?) But these men TRUSTED God and WAITED for Him to act on their behalf! Our first song today is about waiting on God when we are in difficult times. Leader 1: God keeps us safe and watches over us with great care and love! We worship God for His love by giving an offering to God of our money, our time, and our talents! As we sing this next song, you can bring your offering up to the front! Leader 1: This month we will be learning about Daniel, and how God used him to do mighty things. One of those things was to allow Daniel to show God’s power when Daniel was thrown into the Lions’ Den! God kept him save — and this is a song that tells that story! July 5 - What is turning from sin called? To repent means to turn away from sin and turn to Jesus. July 12 - What does it mean to have faith in Jesus? To trust only Jesus to save us. July 19 - What gift do we receive when we repent and believe? Forgiveness of sins and life with Jesus forever. July 26 - What do we mean when we talk about the message of the cross? The life and work of Jesus. Leader 2: Let’s pray! Bow your heads and fold your hands and close your eyes as we talk to God! Father God, we thank You for sending Jesus to be our Teacher, our Friend, our Brother, and our Savior. Jesus, we praise You for going to cross to die and defeating death for us! Holy Spirit, please fill our hearts today so we can know and love You more. In Jesus’ Name, Amen. This week’s SojournKids Bible lesson was “Joseph Interprets the Dreams” (Genesis 40-41). Use the questions below to review it with your kids. You can also review the weekly North Star Catechism (below) and monthly SWORD Bible Memory (back). ASK: Who does Joseph say is responsible for interpreting dreams?Only God knows the meaning of dreams. ASK: Did things happen as Joseph said they would?Yes. God helped Joseph know what the dream was about. ASK: What did Pharaoh do when God told him what the dream was about?He put him in charge of the whole country of Egypt. 36. How do people enter God’s kingdom? We must turn from sin and have faith in Jesus. 1 Thessalonians 1:9b They tell how you turned to God from idols to serve the living and true God.